Spoiler, I’ve had Just Peachy before. 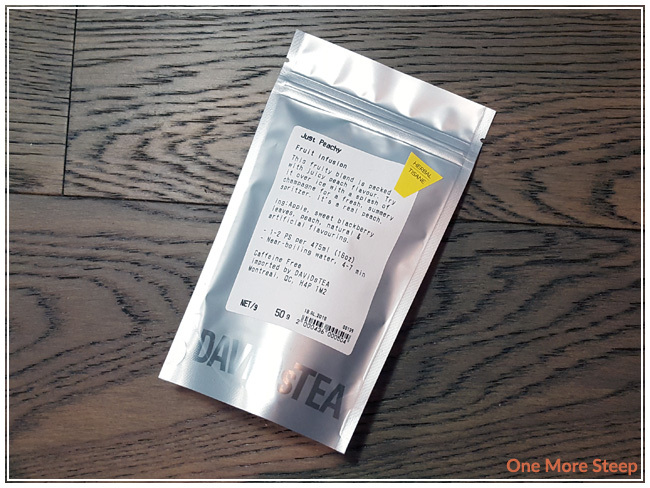 It’s one of my favourite summer-time iced teas from DavidsTea and I realize a little while ago that I hadn’t written about it yet for One More Steep so I decide to do so. I first had Just Peachy in-store when it was offered as an iced tea sample (I’ve also had it hot before and I’ll discuss both further below). The dry leaf of Just Peachy has a very strong peach, fruity aroma to it – which is unsurprising considering the ingredients in the blend. Just Peachy consists of apple, sweet blackberry leaves, peach, natural and artificial flavouring. Of all the ingredients, the one that stands out the most is probably the peach aroma with the hint of apple in the background. If you’re a fan of peach-based iced teas, you might like this one. DavidsTea recommends steeping Just Peachy in near-boiling water for 4 to 7 minutes. I steeped Just Peachy in 93°C (200°F) water for 6 minutes. 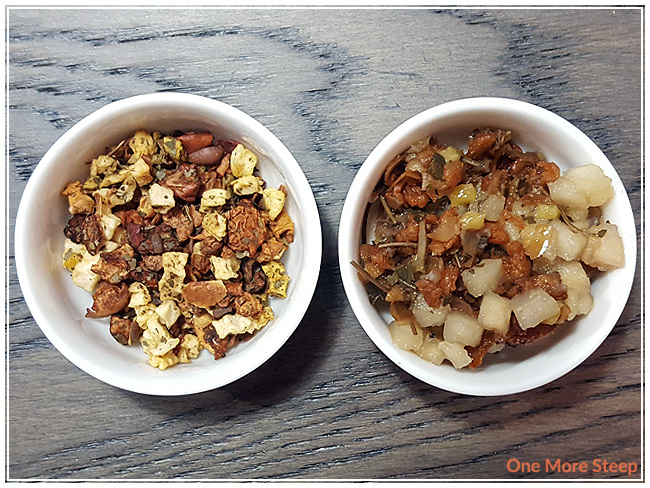 I tend to be okay with steeping herbal or fruit infusions for a lengthier period of time because, unlike teas, they don’t have the tea leaves in there that can become bitter or astringent when oversteeped. Just Peachy steeps to a pleasant warm orange colour with a strong peach aroma. The flavour of Just Peach is peach and sweet. 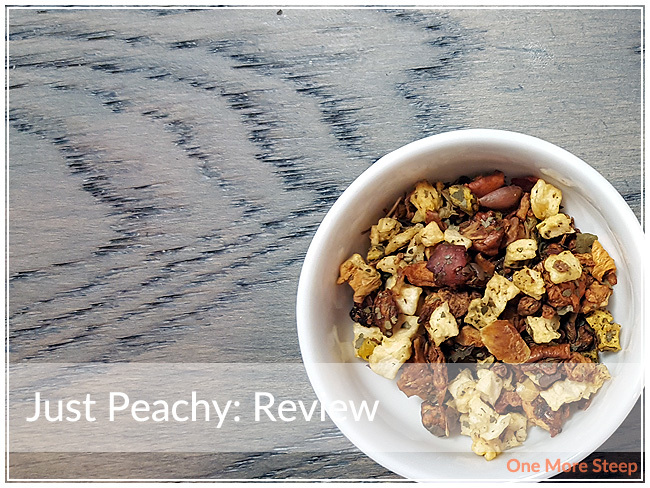 I find that the fruit ingredients in Just Peachy are enough that I don’t have to add any sweetener to it – of course your mileage may vary with your sweet tooth. 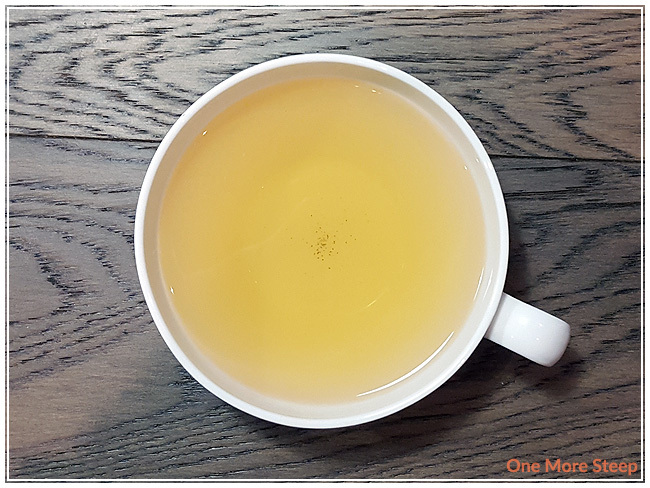 The apple is also a very present flavour in this fruit infusion as well, but the flavour of the apple doesn’t overwhelm or overpower the peach, which is nice considering it’s Just Peachy and not Just Apple. I’ve had Just Peachy both hot and iced. I find when it’s hot, it’s sweeter. When iced, Just Peachy is a nice, refreshing iced tea. I like it both ways, but really prefer to have it iced (especially when the weather’s hot!). I generally cold steep a pitcher of Just Peachy to enjoy throughout the week. I try to resteep Just Peachy, but find that the flavour just isn’t there in comparison to the initial steep. I would say that Just Peachy is good for one steep. 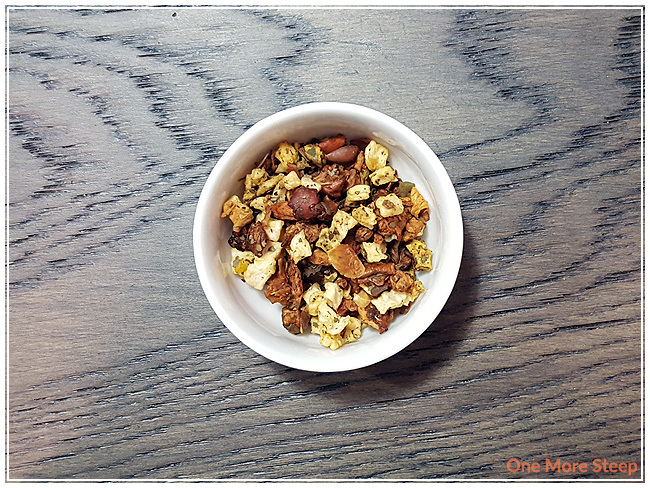 I loved DavidsTea’s Just Peachy. Not really much of a surprise considering it’s a fruit infusion blend that I’ve (re)purchased. I really enjoy the fruity flavours of the peach and love the fact that I don’t have to add any extra sugar or sweetener for it to be a sweet iced tea. Just Peachy is definitely one that I recommend having iced (although it’s very tasty as a hot tisane as well).